Though it’s not NC news, the factors influencing our neighbors to the South often mirror those influencing our waters and are worth tracking. Here’s an update on an earlier post dealing with Gulf of Mexico dead zone modeling. The Gulf of Mexico has a long history of low oxygen that’s tied to discharge of nutrient supercharged waters from the Mississippi River. This runoff supports the growth of algae which, in excess, can result in diminished oxygen levels as it dies off and creates a dead zone harmful to aquatic life. Scientists trying to better understand the factors contributing to the low-oxygen dead zone have been modeling what’s going on. 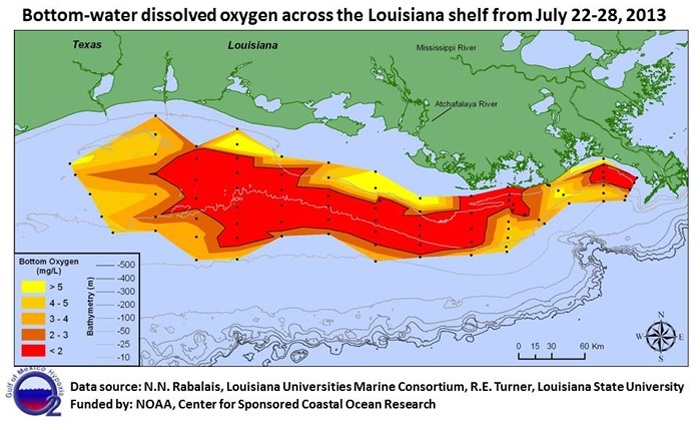 Modeling they conducted earlier this year predicted that the Gulf would see a record dead zone largely fed by farm runoff and heavy spring rains. The good news is that, looking back, the dead zone that occurred was less than predicted by NOAA. The bad news is that the dead zone was still twice as large as the previous year. An article in Mother Earth provides a thorough summary of the data and details the sources of the excessive nutrients making their way to the Gulf – mostly polluted farm runoff. The map below shows the actual 2013 dead zone from this past summer.